What our clients say about The Bike Factory. High Impact, Maximum Engagement and lots of FUN in one of our most rewarding team building activities! 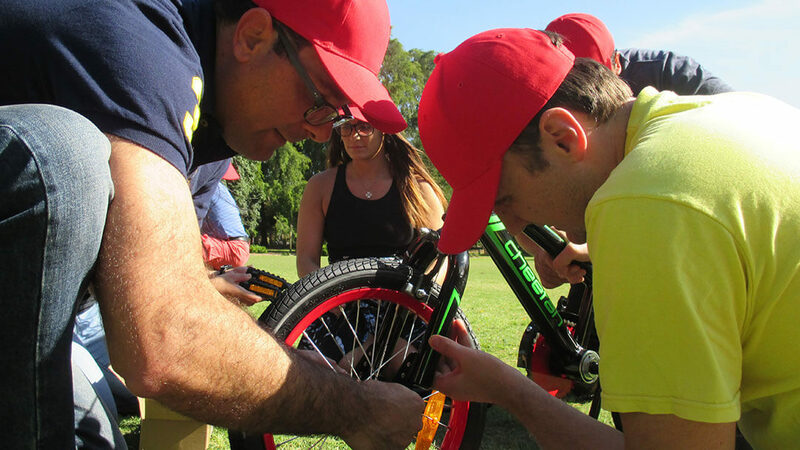 This “Bikes for Tykes” style event combines a focused emotional encounter and a learning opportunity to create a powerful experience for all involved. The Bike Factory will leave your team with heavy hearts and a huge sense of accomplishment. Each program is tailored to suit your group – whether you wish to hold it indoors or outdoors, focus on a specific theme, develop inter-team relationships or just bring the team together for some fun. 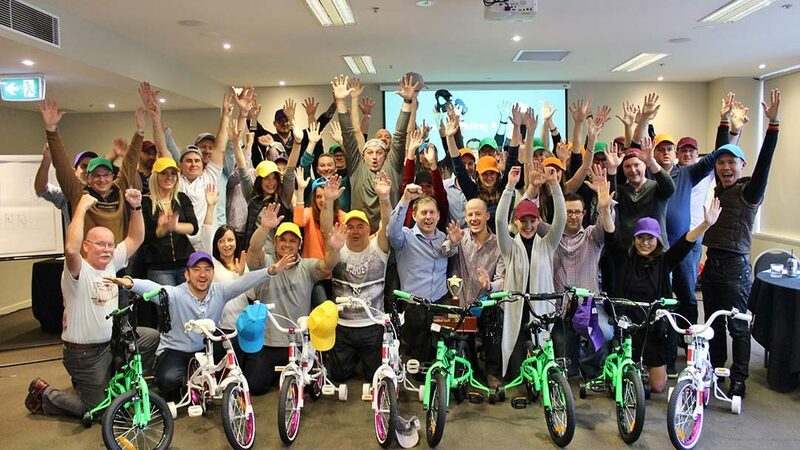 Teams earn bike parts by completing a series of fun interactive challenges and are designed to suit all personality types and promote maximum participation through dynamic facilitation. Once teams have collected all the bike parts, the race is on to build their bikes. The first team to build the bike; and pass their bike inspection from our qualified mechanic, will win The Bike Factory team building activity. Once the bikes are built, we reveal the feel good surprise.. the presentation of the bikes to their new owners. Children are selected through our relationship with several registered children’s charities (or you can nominate your own preferred charity) to donate the completed bikes to. 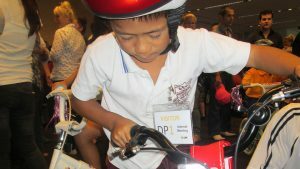 The look on the children’s faces when the teams present the bikes is priceless. The children wheel off with their brand new bike & helmet and your team walks away fulfilled unlike any other team building event they have ever participated in. Just don’t be surprised if there are a few tears of joy.. as The Bike Factory provides a sense of achievement and takes team building to a level many have never experienced. Call 1300 733 385 or enquire now for more information and find out how your next event can be the best ever! We have lots of great venues in team building Sydney, team building Melbourne, team building Brisbane and team building Perth.